Password Recovery is a misnomer, you cannot recover the password only reset it. But if you have a Cisco router and have forgot the password, or purchased a used router and do not know the password, then this is a task you will need to complete to gain access to the router. There are programs available to crack Cisco passwords. These programs are basically useless as they only can crack the user and TTY passwords. They cannot crack the ENABLE password and this is the password you need to gain access to the privileged mode. Resting the ENABLE password for most Cisco devices can only be done by changing the configuration register via the console port. There are two sets of instruction below. The first refer to the 2000, 2500, 3000, 4000, 7000 and IGS series routers. The second refers to the 1003, 1600, 2600, 3600, 4500, 7200, 7500, 12000, AS5200, AS5300, uBR7246 and IDT. 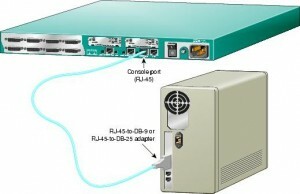 Before we start password recovery procedure we need to attach a computer running terminal emulation software such as hyper-term or PuTTY to the console port of the Cisco device using a roll over cable. Set the terminal software to use the following communication settings. Reset the router using the power switch. Press Break on the terminal keyboard within 60 seconds of power on the router, after this a “>” prompt will be displayed indicating that you are running ROMmon. Type o, press ENTER, and record the current value of the configuration register. Type i at the > prompt, and press ENTER. Type no after each question, or press CTRL + C to skip the setup procedure. Type copy startup-config running-config to copy the current configuration into memory. Note: Do not type copy running-config startup-config. These will erase your existing startup configuration. Type configure terminal, to enter the configuration mode. Type enable secret <password> to change the enable secret password. Enter the no shutdown command for each interface that is used. Type config-register with the value you recorded in step 3 or 0x2102. Press CTRL + Z to exit the configuration mode. Type copy running-config startup-config to commit the changes to memory. Type Reload to restart the router. Press Break on the terminal keyboard within 60 seconds of power on the router, after this the monitor will display rommon 1> indicating the the router is running in ROMMON. Type copy startup-config running-config to copy the current configuration into memory. Note: Do not type copy running-config startup-config. These commands erase your existing startup configuration. Type configure terminal to enter the configuration mode. Enter the no shutdown command for each interface that you use. Press Ctrl-z to exit the configuration mode.